Governor, challenger hopscotch across the state to give voters one last push before Tuesday night's results roll in. 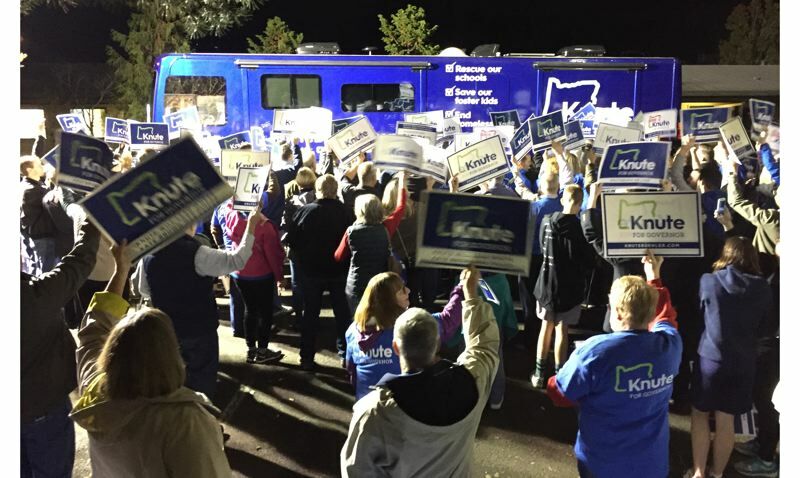 In the closing hours of Oregon governor's race on Monday, Kate Brown and Knute Buehler took very different approaches to finishing up a campaign that has stretched out for more than a year. Brown, the incumbent Democratic governor, journeyed to a college campus, hoping to motivate young voters who seemed to be sitting out the 2018 election. Buehler, the Republican state legislator, took to the air, forsaking his Ford Explorer for a chartered plane to win from rally to rally to rally. Buehler has officially been campaigning for 459 days, announcing his intention to seek the governor's seat on Aug. 3, 2017. Brown, a successor to the office in the wake of scandal, never seemed to stop campaigning after her formal election in 2014. She didn't formally declare her intention to seek one more — one last — term until Buehler had been on the campaign trail for 53 days. She announced her intention on Sept. 25, 2017. Between them, they have raised a record amount of money and just as quickly spent it. Money continued to flow in and out of the campaigns in the last days before the election, much of going to last-minute efforts to reach voters through TV, radio and the web. Each campaign poured about $1.4 million into broadcast advertising the week before Halloween and spent hundreds of thousands more on digital and social media advertising. Yet they still engaged in classic barnstorming — the stump speech, the handshaking, the selfies. On Monday, Buehler, his wife Patty and their son Owen started the day at 8 a.m. with supporters at Lugano's Café in Tigard — one of his favorite haunts during the campaign. He nibbled a scone and drank a latte made with skim milk and two shots of espresso to energize him for what would be an 11-hour journey around the state. "The place was abuzz with people talking about the campaign, Election Day and his plans as governor," said communications director Monica Wroblewski. Buehler hopscotched by plane. On board, he sipped tea to recharge and soothe an increasingly hoarse voice from chatting with supporters. He made phone calls thanking supporters and making a last-minute push to get out the vote. When he wasn't on the phone, he reminisced with passengers about the campaign, said Jordan Conger, campaign policy director. "My favorite memory … was right around when he announced, and he told me he was thinking about running," Conger said. "Just hearing him talk about why he wanted to run and the issues he cared about, what he wanted to do for Oregon and seeing the fire behind his eyes and traveling the state today and seeing a lot of that same passion, a lot of those same issues and everything else, thinking about all of the memories and experiences between then and now over the past year." 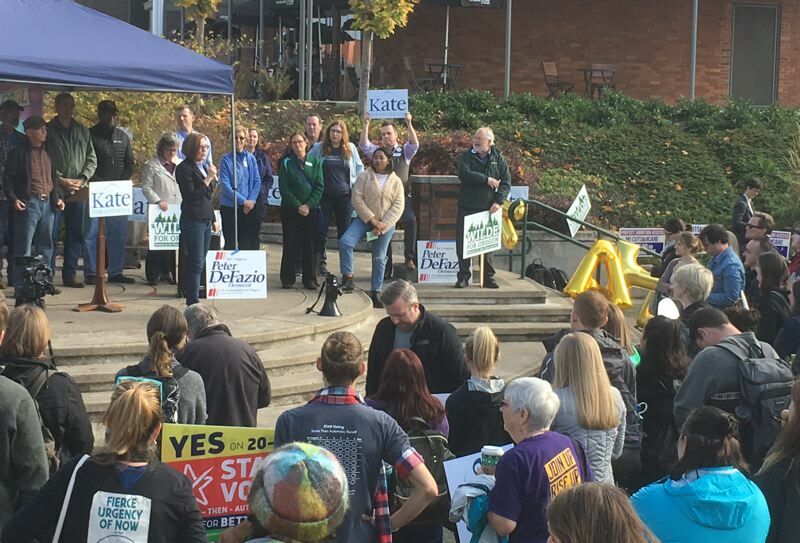 The first stop was Eugene, where he appeared at his downtown campaign headquarters roughly an hour before Brown would speak on the University of Oregon campus at a rally. By early afternoon, Buehler was in Medford at the county Republican headquarters and then on to Bend, his hometown where he maintains a campaign office. Then it was one last flight, back to Portland for a day-ending rally at his primary campaign headquarters in Tualatin. Singer-songwriter Mat Kearney's anthem for the University of Oregon Ducks, "Coming Home (Oregon)" blasted through speakers. "I left my heart in Oregon," the singer-songwriter's voice crooned, as Buehler and his wife, Patty, stepped off the bus. Over the past several months, supporters had left messages and signatures along the length of the bus. One message said "Skoot for Knute." The couple smiled and waved before ascending a platform to address the crowd. "It's going to be something special tomorrow night," Buehler said Monday, "something special that we'll look back on in 2018 and tell stories about what we saw here, that we were part of something that was special enough that we're going to talk it about for decades, that we inspired a whole state to show a different direction, a different possibility in Oregon politics and truly reset what is possible. Thank you all from the bottom of our hearts." The rally marked the final event of Buehler's one-year campaign for governor and of his last day on the campaign trail. Buehler benefited from late-October donations from the Republican Governors Association, which totaled $1.4 million between Oct. 18 and Oct. 26. 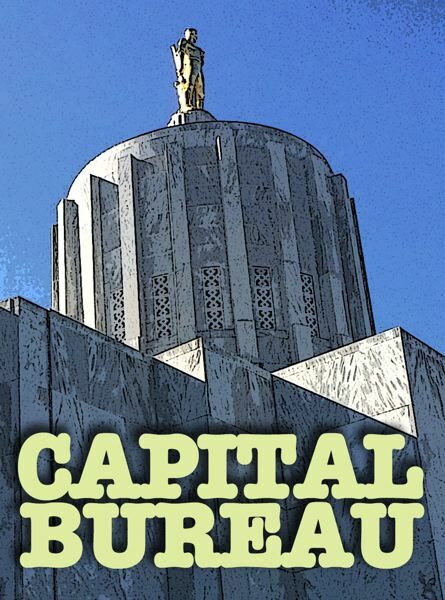 Earlier in the campaign, Nike co-founder Phil Knight made headlines by throwing his weight behind Buehler in a dramatic fashion, giving $2.5 million to Buehler and $1 million to the governors association. As Buehler opened his day with a crowd, Brown stayed at home in Salem, her only scheduled appearance at midday in Eugene. In the last days of October, key liberal groups stepped up with donations of $100,000 or more, including Planned Parenthood, Everytown for Gun Safety and the Oregon League of Conservation Voters. Brown also received $800,000 from the Democratic Governors Association. 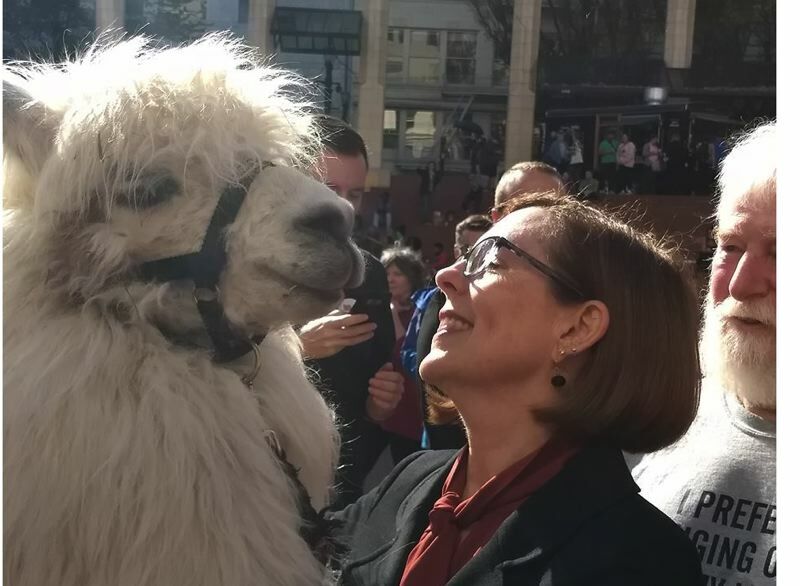 In a rarity, Brown traveled with her husband, Dan Little, and without campaign aides for the hour run Monday to Eugene. She climbed a cement platform at Erb Memorial Union, in the heart of the University of Oregon campus, students gathered to cheer. They had been bestirred by speeches from Congressman Peter DeFazio and U.S. Sen. Jeff Merkley. Some students hoisted political signs, others giant cutouts of Brown's head. One attendee even showed support via livestock, as Caesar The No Drama Llama made the hour-long trek from Jefferson to support the incumbent. Brown deliberately chose the college venue, working to get the millennial generation to participate in the close race between her and Buehler. Christian Gaston, Brown's campaign spokesman, said the younger generation is less likely to engage with campaign volunteers calling their phones. If you want to reach Oregon's young adults, you must go to them. "I think she took about 4,000 selfies with the students," said. "It was just really incredible." Among those showing their support was Patrick Starnes, the Independent Part of Oregon candidate who surprisingly dropped out of the governor's race last week to endorse Brown. Brown talked about campaign finance reform, improving the public education system and pushing back against President Donald Trump. She told the crowd how this was an important election, and everyone should vote. Then, suddenly, a young man pulled out his sealed ballot. He started waving. Chants started. "Turn it in! Turn it in!" The man saw a ballot box about 50 feet away, Gaston said, and ran over to cast his vote amid a chorus of cheers. Brown drove downtown, visiting her local campaign office to thank her volunteers. "Folks were just really excited to see her," Gaston said. "To have the governor come by and thank them personally for all their hours means a lot." Brown and Little hit the freeway, heading back to Salem and a stop at a local union office to deliver more thanks. It was one of the rare times Little joined Brown on the trail. While the two have been married for more than 20 years, Little has largely stayed out of the political spotlight that follows his wife from office to office. The visit done, Brown returned home, penning more thank yous and calling volunteers. And then, a quiet pre-election evening at home with relatives who had traveled to be with her, come win or lose, on Tuesday.